Shannon plans and facilitates The National Rehabilitation Hospital Community Connections Support Group once a month. On a daily basis at work and in her community, Shannon tries to educate individuals with disabilities with information on secondary conditions, housing, Medicaid, and sports activities in the community. Five words Shannon uses to describe herself are Honest, Determined, Shy but Confident, and Abled. Congratulations to the new Ms. Wheelchair Maryland 2010. The next year will change your life — it will take you to places and to people who need to hear your story. And it will cerainly challenge you to be all you can be. The women who accepted the crown will not be the same women a year from now. She will be an empowered women who achieved her goals. From Cathy Porter, Ms. Wheelchair Maryland 2007 and Nancy Carey, her sister, best wishes to you for a wonderful year. Thanks! It was a pleasure meeting you guys. I have been very busy with Ms. Wheelchair and work, but I hope we can get together soon. CONGRATULATIONS BABY!!!!!!!!!! You look FANTASTIC and I am so proud of you. Pete sends you a big hug and a loud: “All right!!! Thumbs up”. All the work you’ve done has paid off. We’ll be rooting for you when you represent MD in California. Please keep me posted. You are a breath of fresh air!!! God bless you, beautiful! Congrats to you Shannon, you deserve it! You are such a nice and fun person. I really enjoyed meeting you on the cruise and hope that we can cruise again! Shannon it is a pleasure knowing you, and you are a beautiful person inside and out, so I wish you well in representing Maryland and if, “Jet magazine had a beauty of the week for quads,” you would be the one. Wow work it Shannon!! Congrats. Go head girl. Well first of all Congratulations to you Shannon. That’s real cool. Can’t imagine how proud you must be? I wished I had known that you had a pageant in November; I would have made attempt to attend. Never the less so very proud of you Shannon. Make sure you contact Thomas in California; so you can have some fans and family to support you while out west. Love you baby keep me posted. When I’m hopeless I think about you. When I’M sad you bring happiness. When I dream it becomes real by seeing your smile. You’re the sun shining in my life, and everyone needs someone like you in their life. I’m happy for you!! Good Luck for the future…. Thats the way Big Sis. I already know you can do anything you want sweetie. They made a bad move giving you that microphone though, they probably had to turn on the music like the Oscar’s. Go to Florida and knock off the rest of them. I am very proud of you and Love you very much. Your Big Bro. Hey girl this is wonderful, you go there and knock them off of there feet and win this, God’s blessing be with you this win is yours!!!!! Hey Shannon, I am very proud of you and what God is doing in your life. You have always been a blessing to so many people that are physically disabled. The Bible says if we are faithful over a few things, that God will make us ruler over many. Because of your faithfulness to the Lord and to others, God can now use you in a much greater capacity to help so many more people. Congratuations Ms. Wheelchair Maryland 2010. And girl you look good in that crown…………LOL. YAY Shannon! We love you! Thank You!!! I love you all. Congraulations we are very proud of you. Please always be your self. With all my love . 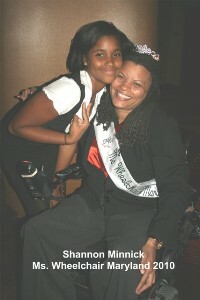 HEY SHANNAON, I’M SO PROUD OF YOU BEING MS WHEELCHAIR MARYLAND. YOUR SMILE WILL BRIGHTEN UP THE PAGENT.YOUR HARD WORK AND ALL YOUR EFFORTS WILL PAY OFF. I LUV U AND CONGRATULATION. Congratulations and I hope you accomplish much much more, and do it for the girls in the chairs!!! Congratulations Shannon! I had no doubt you would win!! : ) Your should wear your sash and crown every day!!!!!! I wanted to say that night was a big one for all of us . Looking at the pictures you have up it looks like you are not letting any grass grow under your feet. Good gi\rl and Please don’t forget what you said to Anninet that nght. See you in November and at the Woman expole in March. O by the way Happy New Year to You sorry for it being late after I came home from my vaction I walk in to a mass here in the apt.someone had come in and help their self to alot of my things,.so it taking me some time to get back to things. Congratulations Shannon! You inspire so many with the work you do. We truly need more people in the world like you. Keep up the good work!! If you are ever confused about who you are, and what you want to do, it’s simple. Be the change you want to see in the world. Beauty of a woman is not in the clothes she wears, figure she carries, or the way she combs her hair. Beauty of a woman must B seen from her eyes, ’cause that’s the doorway 2 her heart, place where love resides. Beauty of a woman is not in a facial mole, but true beauty is reflected N her soul. It’s in the care she lovingly gives & the passion she shows. The beauty of a woman, with time, only grows! B STRONG! I am so proud of you Shannon! I know you will win Ms. Wheelchair USA without a doubt. The world needs more phenomenal women like you. You are a miracle may God continue to use you for the sake of others. God bless you Shannon!! You are just tooo much!! I’m just thankful to God that he allowed our paths to cross and you to forever be my bestest friend. I LOVE YOU GIRL!!! Hey Shannon! this is so cool! I’m happy 4 you! CONGRATZZ!! WE love U and can’t wait to go to this event in silver spring!! Hi, I am a 16 year old with CP…Shannon lives in my dad’s apartment building! Go Shannon! I have had the pleasure of not only meeting but becoming a friend to Ms. 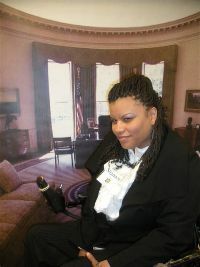 Wheelchair Maryland 2010, Ms. Shannon Minnick. She is truly an inspiration and has gracefully carried out her mission as Ms. Wheelchair Maryland and continues to do so. Continue your calling in excellence as you have already done. I am so grateful to have you in my life. You have been such an inspiration to me and I know you have been and will continue to do so much more for many others. Your words of encouragement and genuine friendship have carried me through some tough times. Congrats on your accomplishments! Love you! Hi Shannon! I can’t wait for you to compete in nationals, all you have to do is be yourself and you will do amazing. You are such an inspiration to everyone! Go Shannon!!!! Best of luck to you at the national pageant next week. Shannon is a pleasure to work with. Her pleasant demeanor and incessant smile make her very comfortable to be around. Shannon is always very open to new ideas, and enjoys going out into the community and provide disability education which has been very well-received both by teachers and the students. She has a big heart and her mission in life is to help individuals with a disability to strive and overcome both physical and mental barriers, and she does a wonderful job doing just that. We’re all so proud of you!!! Shannon Minnick you represent this area well, you are a beautiful person inside and out. If they just measured your inner beauty you would win hands down. I wish you well on your trip come back soon, NRH needs their angel. Shannon I am so proud of you, and as you suggested…I have decided to run for Ms. Wheelchair Maryland. Shannon, I’m so proud to call you my friend and sister. You make the world a better place for everyone. You show everyone that anything is possible and that we can do anything that we set up in our mind to do. You are an inspiration to all of us. Your smile can light up a room and your words of wisdom can make everything OK in the world. I wish you the best of luck in Michigan at the pageant. I wish I could be there to show my support but know that I’m there in my heart cheering you on. Im SOO Proud Of You Shannon Your such A Inspiration To Me And EVERY Body Living With A SCI Because Everything I Thought I Couldn’t or Think I Can’t Do In Life After My SCI She has Done It 100 Times.She Is The Soul Reason Why I Wanted To Work At NRH And Become A Mentor Cause She Keep Me SOOO Positive And Moving On..SO I JUST WANT TO SAY THANK YOU AND GOOD LUCK WITH EVERYTHING!!!!!!! Hi Cousin! Well let me see…you have succeeded at, and accomplished things that have eluded many living without a disability. You have two thriving children; a grounded, intelligent senior in college and a witty 13 year old (smile), you live happily independent, graduated from college, established a career in which you help others living with SCI realize that they can live happy productive lives, and you hold the crown of Ms. Wheelchair MD 2010, just to name a few. Your infectious smile and personality are perfect compliments to your take charge spirit and bold confidence. You make the world take notice! This is your season. You have been prepared for a time such as this. Know that your family is extremely proud of you and cheering for you all the way. Grand Rapids better be ready for the next Ms. Wheelchair America 2010! Congrats on your success. You truly deserve all the best life has to offer. See you in the other winners circle! Much Love…. Way to go Shannon!! Keep up the good work . I am l rooting for your success. You are a fantastic role model of how to overcome enormous obstacles by faith and perseverance. We will miss you and wlil pray for your continued success and happiness. Congratulations! Im so proud of you! You are fantastic at multi-tasking – you make it all happen! If you say you want to do it – it gets done! I believe you have found you’re calling. Your passion to help others is admirable. So, continue to stretch and reach for higher heights. Stay strong and beautiful as always! I’m wishing you much success in Michigan! You are the essence of ENCOURAGEMENT, the foundation of STRENGTH, the definition of COURAGE! I’m so proud of you!!! You showed tragedy the meaning of TRIUMPH and I pray that God allows the WORLD to see it through you. Thanks for being a blessing and never stop sharing your gift!! You are truely a remarkable young lady. I admire and respect you for all that you do and you have accomplished. When I meet you years ago I knew you were a special person that is the reason that I hired you to come and join my team to work for me. I have seen you grow in so many ways. You are a great person and a excellent mom to your kids. I admire that you are so determined and you never give up. Once you put your mind to something the sky is the limit for you. 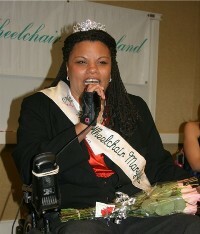 I was so happy for you when you were crowned Ms. wheelchair of MD. I hope you win Ms USA wheelchiar. No one deserves it more than you. I know you will knock them dead with that gourgeous dress you showed me. Good luck and I will always be there for you. May God continue to bless you and your family. Live life to the fullest ! WOW! As I read all the wonderful comments I’m thinking are they talking about me. I can’t help but cry! I love you all in one way or another you all have given me strength. My passion for what I do daily is possible because of my family and friends. With out your support I would have given up along time ago. My best friend Sabrina never let me give up on life. Robin supported me in everyway possible. My Sister Theresa as listened to me laugh and cry and all at the same time sometimes. NRH family it’s time to PARTY!!! My rein is officially over Oct. 30, 2010. It’s time to thank everyone for supporting me. Ms. Lisa gave me my first job when no one else would hirer me. She became one of my good friends and hero’s. I LOVE YOU! Tali must be tiered of hearing my voice. She sat up late nights listening to my speeches and tweaking them. Thanks Honey! To my baby ERIKA, who gave up a year of her life running around helping me with the Disability Awareness Experience and many other events. Thank You!!! You are my strength! I LOVE YOU! Robert, this year has been amazing for me! Becoming Ms. Wheelchair MD 2010 has opened my eyes to several things. I have learned that anything is possible and I can do anything I put my mind too. I have grown in so many ways. It has shown me that I need to be doing more to help improve the quality of life of individuals with disabilities. I will! I have! I can! The wheels in my brain are all ready turning. Because of the great opportunity you gave me to become Ms. Wheelchair MD 2010. I have embraced my disability and improved my overall quality of life. I’m more confident in myself and what I could bring to our community. Because of you I will do great things that not even I could imagine. I thank God for allowing or paths to cross. I’m ready to see where my next journey will take me. Hey, don’t get any ideas… I’m looking forward to working more with you in the following years. YOU ARE GREATNESS! Thank You, for believing in me and my dream!